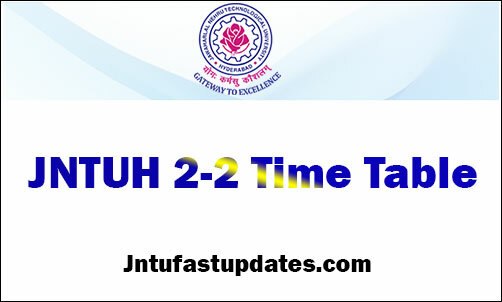 JNTUH 2-2 Time Table 2019: JNTUH B.Tech 2-2 Sem (R16,R15,R13,R09) Regular/Supply Exam Time Tables May 2019. Students can download JNTUH 2-2 Time Table R16 or JNTUH 2-2 Time Table R15 or JNTUH 2-2 Time Table R13 below. JNTUH is going to conduct the B.Tech 2-2 Semester examinations in the month of May/June 2019 for R16, R15, R13, R09 regulations. The B.Tech 2-2 Sem Regular/Supply examinations to be held from 6th May, 2019. Hence candidates pursuing the B.Tech course under JNTUH can check the exam date sheet from the official website, jntuh.ac.in. Jawaharlal Nehru Technological University Hyderabad is the public university in Telangana. The university was situated in Hyderabad. It is one of the oldest universities of Telangana state. It offers 77 various programs such as M.Tech, MSIT, MBA, MCA and MSc and others. Many of the colleges work under the affiliation of JNTUH in Telangana state. Annually lakhs of students come out with certification from this varsity. The JNTUH looks after the education process and provides the quality syllabus for the students. It conducts the examinations in the semester system, that is yearly twice. Students presently studying under JNTUH can check the B.TEch 2-2 date sheet details from the following. The JNTUH annually organizes the academic examinations in semester format. All the 1st semester examinations will be conducted once and 2nd semester examinations will be conducted once for all years. The JNTUH has released the 2-2 Sem R16, R15, R13, R09 exams Time Tables 2019. JNTUH 2-2 Time table May 2019 for various regulations R16, R15, R13, R09 has been released by the JNTUH. So, aspirants, who are eagerly waiting for the JNTUH B.Tech 2-2 Time table, can download the time table from JNTUH Official website, jntuh.ac.in. Also, students can click on the direct link provided below. After downloading the time table, go through it to check the exam dates and more guidelines for the examinations. Students are instructed to download JNTUH B.Tech 2-2 regular/supply hall ticket to proceed to write the examinations. Students pursuing the 2-2 semester and students who are having backlogs in 2-2 semester can appearing for the examinations. 3. In the recent notifications, students can find the link of JNTUH B.Tech 2-2 time table 2019 May. R U SURE BRO?PLEASE REPLY…..
UPTILL WHICH DATE EXAMS MAY BE POSTPONE…TILL MAY 23RD ELECTIONS OR MAY MONTH…….IN JUNE MONTH EXAMS WILL BE THERE AAH BRO?PLEASE REPLY…..
SIR PLEASE DONOT POSTPONE SIR EXAMS…RELEASE TOMMORROW TIMETABLES……NO WAIT SIR…IN TIME ON 6TH MAY ACCORDING TO ACADEMIC CALENDER……..
when you are going to release exam time table….? you were released notification on April 3rd but till now thier is no updates about exam time table…..
we are daily checking for updates but thier no update…. i kindly request you to realse exam time table as soon as possible…..
Hello sir this is regarding the no of attempts left for r09 batch year 2011-2015 tell me how many attempts are left for me to clear the subjects and I have been detained for one year ie 3rd yr because of credits . Please tell me sir.